Here's some japanese stuff I finally got around to getting ingame. The Power plant, the wave force artillery, and the sudden transport. The Power plant of the japanese is a very usefull structure, not only because of it's essential role of providing the Japanese bases with power, but also because of it's nanocore form and the increased mobility that it gains from it. 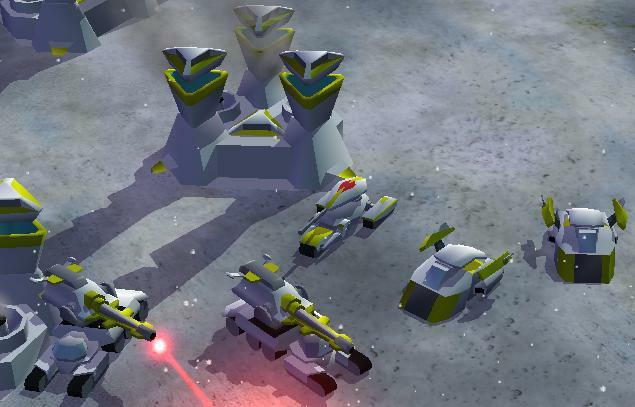 Power Cores can be deployed rapidly and in many locations at once. The Wave Force artillery is the japanese artillery unit. It's slow and expensive, but it packs a good punch. I don't think I'll be able to implement the 'fire now" button as seen in Ra3. Finally the sudden transport. Perhaps one of the most kickass transports ever, it's amphibious, it can carry 5 infantry, and it can disguise as enemy vehicles! So many possibilites of sneaky tactics, but the Emperor has ordered that it's secrets may not be shared. The suddens work all too well. That is, at least, until your opponent realizes that guardian tanks aren't amphibious. Or Shogun Battleships can't go on land. DaFool, a substitute for the Premature Burst can be done with firemodes. Not perfect, though. It's either at full power or lesser. Maybe it just fires quicker and weaker at units and infantry and then full blast at buildings. well, every unit in RA3 has a secondary ability. Which to me, means that atleast a handful don't really belong there and thus were there just fro the sake of having a secondary ability. So i think the "buy it now! ", I mean "fire it now" button is kinda pointless. Sure it lets you be a little better vs infantry, but I want you to mix your forces, not just focus on spamming one. Empire units with non moving parts are getting scarce for me to make, I think I have the skywing, and then everything else has legs.